Every year Port Hedland Seafarers Centre will pack and distribute thousands of Christmas gift bags to Seafarers who will be berthed in the harbour or on standby at anchorage, up to 42 kilometres out to sea. The below video and photos are an insight to this massive undertaking. Theme of the evening was A Night In Paris and guests dressed accordingly. Due to the success of our Harbour Tours, most felt we could surely win the Tourism award, however it was not to be. 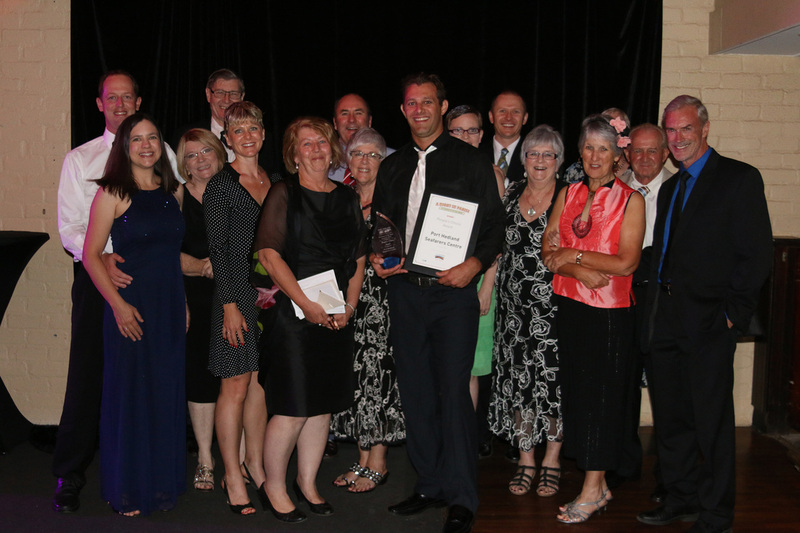 Any disappointment was quickly put aside when the final award of the night, The Inaugural Peoples Choice Award was announced, and the winner, The Seafarers Centre. The Seafarers Mission is unashamedly a Christian organisation and we must thank God for the vision of the harbour tours but we also send a huge thank you to all our staff, committee members and all associated with the Centre. To win this award is a sign that we are succeeding in our efforts to welcome both Seafarers and visitors, and continually working towards looking after the welfare of the Seafarers. Feedback from our Harbour Tours includes words such as awesome, excellent, impressive, and wonderful, whilst every day our efforts to help the seafarers are rewarded with happy smiles and thank you's as well as thank you emails from many Captains of the visiting ships. Royal Australian Navy vessels seldom visit Port Hedland (the previous one was in 2013) so it was a great opportunity when HMAS Sirius came to Port Hedland earlier this month for a few days. 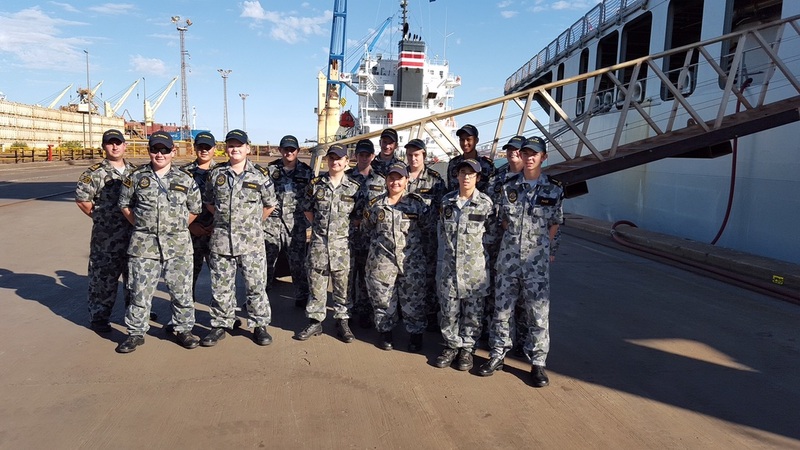 The navy cadet unit in Port Hedland, Training Ship (TS) Pilbara immediately liaised with the HMAS Sirius and Pilbara Ports Authority to organise a tour for the Navy Cadets. The logistics of organising the visit included gaining permission to access the wharf where HMAS Sirius was berthed. Private vehicles are not permitted and it was a great relief when the Port Hedland Seafarer’s Centre agreed for the cadets to utilise the Seafarer’s Bus for the ship visit. Thirteen TS Pilbara cadets, 2 staff and a few parents and siblings boarded the Coaster bus after meeting at the Seafarer’s Centre, passed through the security gate with their IDs in hand, and proceeded to berth PH1. The duty officer and crew of HMAS Sirius welcomed the cadets at the gangway and gave a very informative tour of the ship. An hour later the tour was over, the group returned to the bus and headed back to the Seafarer’s Centre. 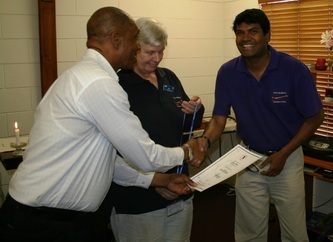 It was an interesting afternoon which would not have been possible without the assistance of the Seafarer’s Centre. The TS Pilbara cadets enjoyed the tour immensely and it was an opportunity for many of them to discover what the Centre offered to the seafarers. Taken from The North West Telegraph - Wednesday 1st July 2015. By Ben Leahy. 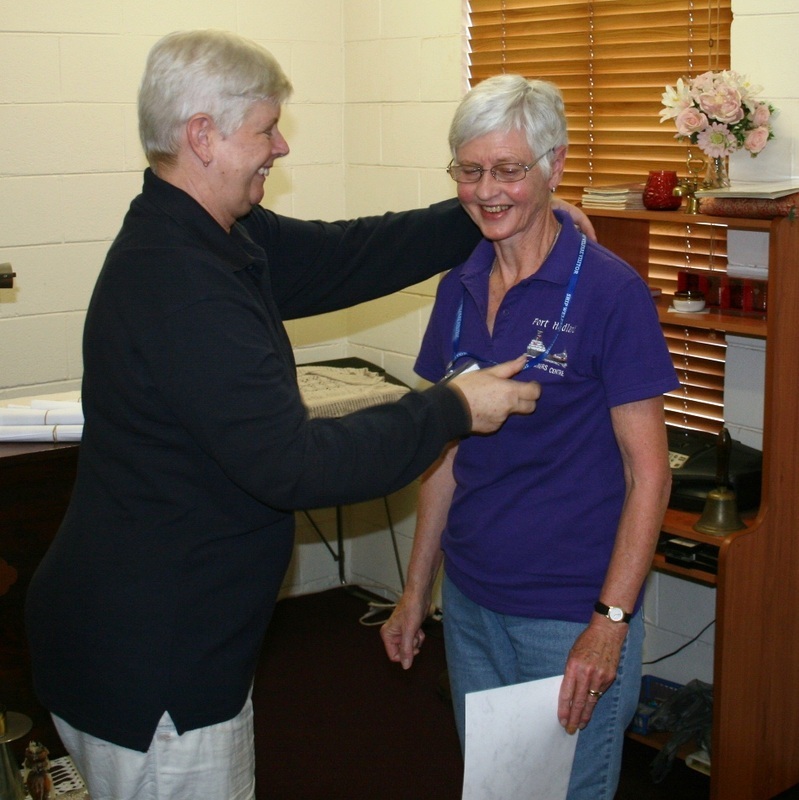 Port Hedland Seafarers Centre senior chaplain Alan Mower interviews his colleague Garry South. Visiting grey nomads can now gain much greater insight into H﻿edland’s port and mining operations, thanks to a new documentary film by the Seafarers Centre. The Power behind the Port documentary put together by the Seafarers, allows viewers to see Hedland’s harbour from unique angles, be it on-board a tugboat, the bridge of an iron ore carrier or inside a helicopter. Even long-time residents are likely to find it interesting, given the film packs plenty of information about how Fortescue Metals Group’s mining operations work or how Dampier Salt transforms ponds of seawater into mountains of salt. Seafarers Centre senior chaplain Alan Mower said sales of the film would help raise funds and awareness for the non-profit group. 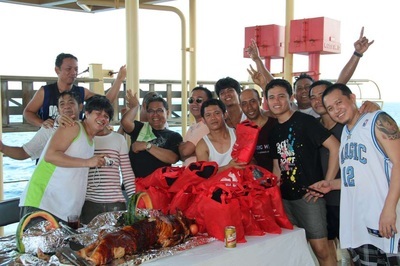 The short film continues a push by the Seafarers to use innovative tourism initiatives to raise money to increase services it provides to visiting iron ore carrier crews. Last year, the centre launched successful harbour tours, which allow visitors to follow Seafarers staff around the port on a small boat as they pick up crew members from visiting vessels. The unique tours allow the visitors to see the huge iron ore carriers upclose — a view they could not otherwise get because of the port’s stringent health and safety rules. Mr Mower said as a result, numbers on the tours had skyrocketed this season. “We’ve had to put extra tours on. On many days, when the tide allows, we are running two tours a day,” he said. Power behind the Port is available at the Port Hedland Seafarers Centre in Wilson St.
Taken from The North West Telegraph - Wednesday 24th June 2015. By Ben Leahy. 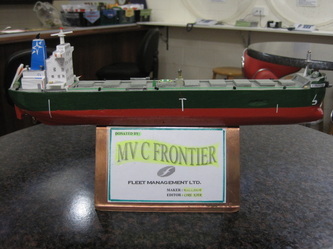 Port Hedland Seafarers Centre says it is working with retailers to improve the service they provide to crew members from visiting iron ore carriers. Seafarers’ centre Senior Chaplain Alan Mower said visiting crews were not always treated with the respect or high-quality service they deserved. This ranged from incidents at the Port Hedland Boulevard Shopping Centre, in which crew members were verbally attacked, to past restrictions imposed by Woolworths Supermarket on the amount of baby formula they could buy. “About three years ago we had a seafarer who was arrested, jailed and deported for taking improper photography — and that is rightly so,” he said. “But when you have that sort of thing happen … certain corners of our community tar them all with one brush. The centre’s plea comes as Hedland residents often express concern about the potential mental health impacts of fly-in fly-out work practices but give little thought to iron ore carrier crews. The foreign seafarers can spend up to nine months at a time on their vessels as they play a key role in boosting Australia’s iron ore exports. Mr Mower said visiting crews also injected about $4.5 million into the local economy, based on the amount of foreign currency they exchange into Australian dollars. Pharmacy 777 Port Hedland proprietor Laura Stewart said she valued the crews’ business so much she had created Chinese language signs and special stands filled with the Australian-made products they prefer. “They are a really important part of our business and they bring extra foot traffic through the centre and to us,” she said. Mr Mower said his centre focused on providing pastoral care to visiting crews, but reserved the right to bus them to the shop owners who would treat them best. Taken from The North West Telegraph - Wednesday 17th June 2015. By Ben Leahy. Port Hedland Seafarers Centre is hoping to gain a licence to sell duty-free liquor to crew from visiting iron ore carriers. Seafarers centre senior chaplain Alan Mower said visiting crews liked to buy cask and bottled wine for consumption on board their vessels and as gifts for family and friends back home. However, under tough Hedland liquor restrictions, sales of cask wine can only be made between 2pm and 4pm, while bottle shops also impose limits on the number of wine bottles individuals can purchase during a single visit. He said duty-free sales could help overcome these issues to meet the needs of seafarers. “It is a bit of a lucky dip for the crews to get ashore and to the shop during the time when cask wines are available and being sold,” Mr Mower said. 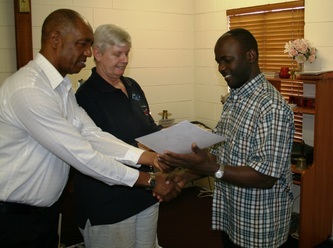 The move by the seafarers centre comes as it estimated visiting crew members spent $4.5 million in the Hedland economy every year, based on the amount of currency they exchange into Australian dollars. Yet Mr Mower said his nonprofit group’s decision to seek to expand its liquor licence to allow for duty-free sales was not a money grab. He emphasised that under duty-free restrictions all liquor sold would have to remain capped until the crew members were back aboard their vessels. “We don’t want to cause a problem in the community. The last thing we want to do is go against the Hedland liquor accord,” he said. “It is not about trying to grab other parts of the closed (liquor) market. “We won’t be selling beer or spirits or cigarettes, none of that. It is just purely wine. That needs to be well understood. Taken from The North West Telegraph - Wednesday 4th February 2015. By Heather McNeill . ﻿﻿﻿Seafarers Centre chaplain Alan Mower accepts a defibrillator from St John Ambulance Hedland branch manager Phil Stanaitis, while FMG’s Gerhard Veldsman and St John’s Charmaine Knight look on. ﻿Three Hedland community organisations have had automated defibrillators installed on their premises to allow first responders to give immediate assistance in an emergency. Triple-zero operators will also be alerted to the defibrillator locations at the Port Hedland Seafarers Centre, Hedland Well Women’s Centre and Bloodwood Tree Association if an emergency call is received. St John Ambulance Hedland branch manager Phil Stanaitis, who donated the defibrillators thanks to a Fortescue Metals Group community grant, said the devices greatly improved the chances of survival. “There are plenty of examples that show these things can save your life if they’re applied quickly,” he said. He said the Seafarers Centre was chosen to receive a device because it has about 4000 people passing through each month, and was on the other side of town to the ambulance depot. People in surrounding areas, such as The Esplanade Hotel, will also be close to the life-saving device. “It got me thinking you never really know the health status of anybody — anybody can collapse with a cardiac arrest at anytime.” Seafarers chaplain Alan Mower said the donated defibrillator was “another piece of the jigsaw puzzle” in caring for its clients. FMG co-ordinating general manager for port and rail Gerhard Veldsman said the mining group was proud to donate the life-saving equipment, but hoped the three centres never had to use them. “At Fortescue, the health and wellbeing of our people and the importance of being our brothers’ and sisters’ keeper is paramount, and we know that the same is true across the wider community,” he said. Taken from The North West Telegraph - Wednesday 24th September 2014. By Ben Leahy. Former seafarer Mohankumar Mahesh Kumar had an unforgettable week in Mumbai, India, earlier this month. Not only did the Indian national take his first steps unaided on an artificial leg, but he also accepted $43,000 donated by members of the Port Hedland community. The Port Hedland Seafarers Centre co-ordinated the fundraising after Mr Kumar lost his right leg below the knee in an incident on an iron ore carrier in Hedland in June. Local Seafarers operations manager and senior chaplain Alan Mower flew to Mumbai to present the donated money to Mr Kumar at a September 15 ceremony, which he described as a moving experience. “Here was a man who, the last time I saw him, had no leg and was in (South Hedland) hospital with a real lost hope type of attitude,” Mr Mower said. “Now (over in India), I was seeing a guy who had real confidence and was looking towards a new life with re-born hope for his future.” Port Hedland’s remarkable support, not only amazed Mr Kumar himself, but also caught the attention of the Indian community and press. Joining Mr Kumar’s family at the Mumbai ceremony were Catholic bishops and clergy, members of Indian unions and seafarers groups and representatives of his employer, the Anglo Eastern Ship Management company. Along with Mr Mower, fellow chaplain Garry South flew over for the ceremony, using money from the Port Hedland Seafarers’ budget. Mr Mower said the trip opened his eyes as to how important seafaring jobs could be for Indian men and their families and this made him more proud of the Hedland community’s support, including notable donations to Mr Kumar by the Pilbara Port Authority and FMG Social Club. Hedland’s Indian-origin community also raised $5600 for Mr Kumar, while tug operator Teekay Corporation and the Maritime Union of Australia each donated $5000. Taken from The North West Telegraph - Monday 3rd December 2014. By Ben Leahy. Port Hedland Seafarers Centre staff spent last week climbing into helicopters, iron ore carriers and tug boats to get a different view of port operations for a new promotional film. The short film outlines the nonprofit centre’s charitable work in aid of seamen, but also gives an insight into operations at the world’s biggest bulk export tonnage port. 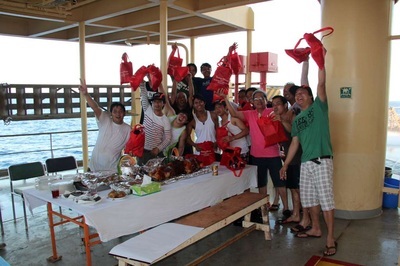 The short film continues a push by the Seafarers to branch beyond providing key support services to seamen and into tourism as a way to help fund its operations. The centre launched its successful harbour tours this year, which allow visitors to follow Seafarers staff around the port on a boat launch as they pick up crew members from visiting vessels. Mr Mower said he planned to expand the tour program next year and hoped tourists would be interested in buying the film as a memento of their tour to take back to show family and friends. The Seafarers team joins a tug boat crew as the vessel guides an iron ore carrier out to sea. Port Hedland’s port operations are immense. Not only is the port the world’s largest bulk-export port, it is also Australia’s largest export port by tonnage and home to the country’s biggest tug fleet. Until recently most tourists only ever caught a glimpse of the vast operations from the shore. But that is changing after the Port Hedland Seafarers Centre began in May to bring tour groups on its regular shuttle services to pick up crew members from iron ore carriers berthed in the harbour. The shuttle services enable the crews to come ashore to shop and phone loved ones, but for the tourists the boat ride is a chance to see port operations up close. Narembeen tourist Chris Padfield said the size of the 300m-long iron ore vessels from a 30m launch was breathtaking, but most surprising was how quiet the port was. “It was very well organised and for a busy port there was no hustle and bustle, it was peaceful,” she said. But while Ms Padfield and a growing number of people are signing up for the tours, the nonprofit Seafarers centre is not necessarily running them to boost local tourism options. It instead intends to use the profits to run even more boat and bus shuttle services. Operations manager Alan Mower said the services were invaluable to the around 60,000 seafarers visiting Port Hedland annually. He said the crews aboard the visiting vessels did not have security clearances to pass through Hedland’s port areas, so the launches operated by the Seafarers were the only way they could come ashore. It is an opportunity most crew members jump at, given some can spend up to nine months aboard their vessels. Once ashore, the centre also runs bus services to take the crews to the Port Hedland supermarket and provide communications services for them to contact loved ones. Seafarers chaplains also provide spiritual services to crews, while seamen and women from other faiths can be directed to local Hindu or Muslim communities. Mr Mower said his centre also commonly helped crew members contact the relevant authorities when they had complaints about their salaries or working conditions. "It is amazing the issues we face,” he said. “We’ll get crew that have been through a pirate experience and they will need to download (their experiences to a listener) and be counselled.” Yet the work done by the Seafarers Centre is not just to the benefit of visiting crews. Mr Mower estimated that of the 60,000 crew members visiting Port Hedland annually, up to twothirds came ashore using the centre’s services, providing an estimated $7 million boost to the local economy. A crew member waits to board his vessel. Visiting engineer from Kalgoorlie-Boulder David Hindle came to admire Port Hedland’s construction marvels. Sitting in on Ray Ives’ description of the Port Hedland port and its operations, you could be forgiven for believing he is long-time resident. 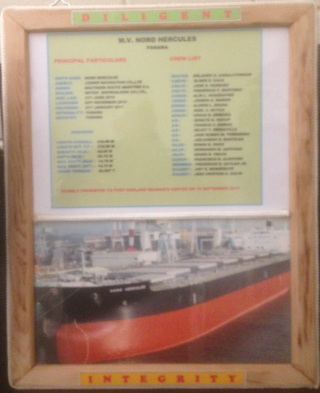 Not only can he tell tourists attending the Port Hedland Seafarers Centre tour which mining company exports from which port berth, he can even fill them in on the harsh conditions many seafarers face when out at sea. Yet Mr Ives, who has volunteered as a helper at the Seafarers for the past three months, is not from Hedland — in fact, he is not even from near the ocean. He has instead spent most of the last three decades in landlocked Gunnedah in New South Wales, a small town known for its koalas, not its waves. “We were looking forward to this as a sea change, so to speak, because Gunnedah is five hours away from coast and also it was a chance to see the scale of what goes on around here,” he said. 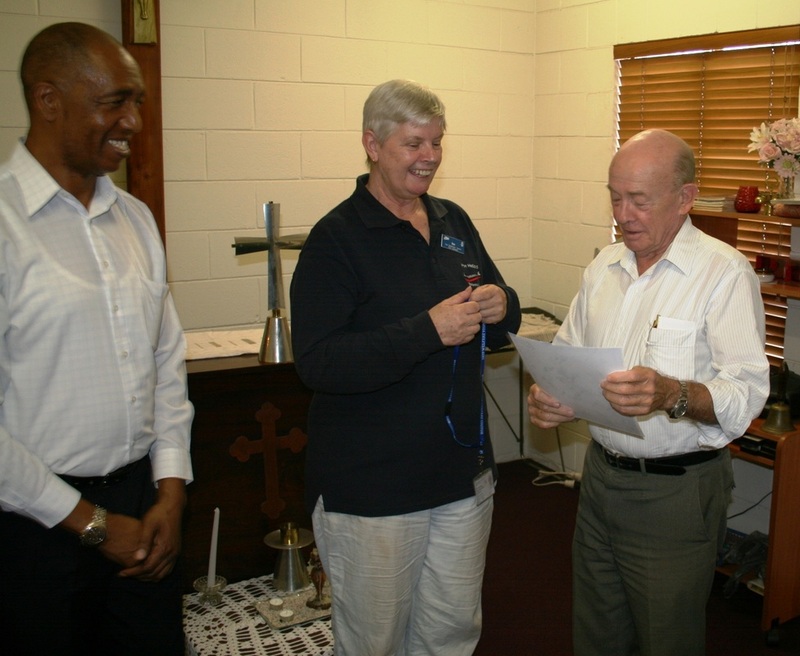 Mr Ives and his wife Janette’s unlikely volunteering roles had their origins in August 2013, when they met the Seafarers operations manager Alan Mower while visiting Hedland’s Anglican Church on a previous trip. When Mr Mower suggested the couple might come back the next year as Seafarers volunteers, it struck a chord with the Ives, who had retired from their own retail business back home. 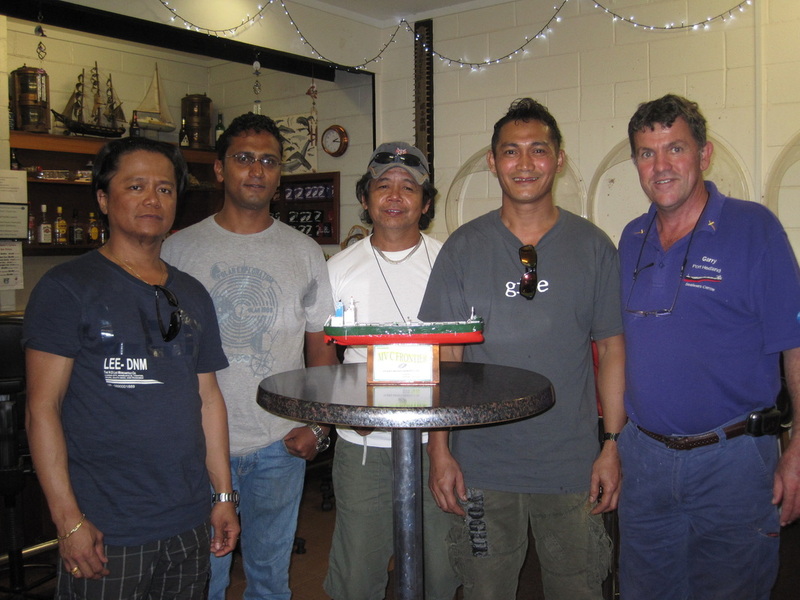 They have been helping in the Seafarers shop and leading tour groups since June, but are set to head home again this week. Fortunately, they do not have too much gossip from back home to catch up on after a tourist from Gunnedah recently joined one of Mr Ives’ Seafarers tours. “I didn’t know him personally, but I did know his father from years gone by,” Mr Ives said. The Port Hedland Seafarers Centre is excited to announce that Starting in June 2014, the centre will be offering Daytime Harbour Tours to the general public. Get up close and personal with the huge Iron Ore Ships in the Port Hedland Port, on our working seafarers launch boat. For more information, please Contact Us or visit us at the Seafarers Centre. 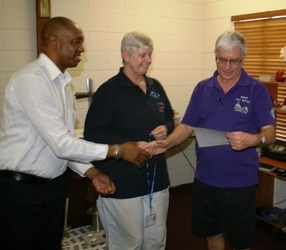 The Port Hedland Seafarers Centre has a new VHF Radio channel for Ship to Centre communications. This channel will only be manned during opening hours. The old channel is no longer being monitored. Of course, you can contact us via other methods also. Please have a look at the Contact Us page for more info! 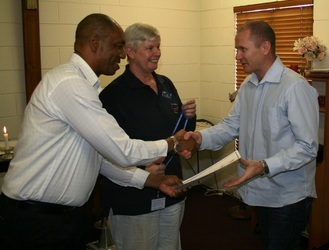 Port Hedland Seafarers Centre is proud to announce our appointment as a local agent for Integrity Coach Lines. Check out the Port Hedland Seaf﻿arers Centre Facebook Page for up to date information and details of everything that happens at the centre. In this moving piece, Adrian Plass paints a picture of the work of the Sailors' Society as it seeks to help the world's seafarers who﻿ often face extremely difficult conditions. 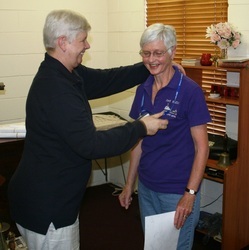 The Sailors' Society is an organisation much the same as the Mission to Seafarers. 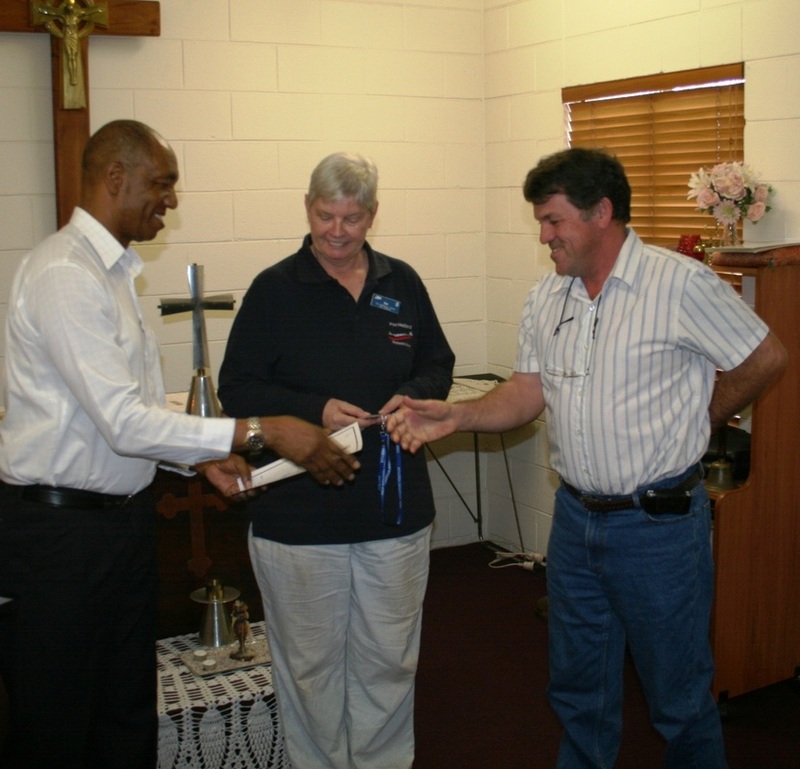 Recently it was a great pleasure for the Port Hedland Seafarers Centre chaplain Alan to connect with two of Fortescue Metals Group's chaplains, Rod & Don. We welcome the fact that bridges exist between the mission and the workplace, and commend FMGL for your approach to the care of those entrusted to your care. 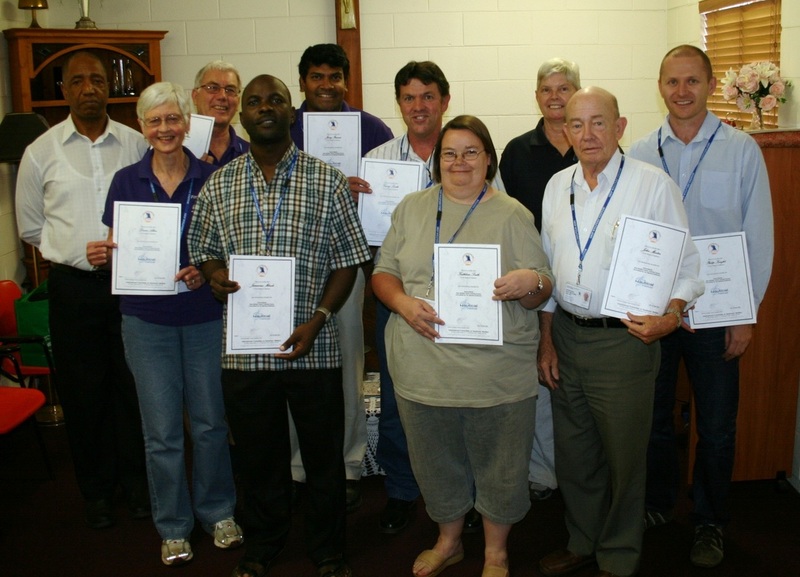 12-07-2013 - The Port Hedland Seafarers Centre has added additional bus and launch services to their already busy schedule. The bus will visit PHPA and the supermarket, while the launch will attend to the ships at berth. Some of the crew of the MV Nord Hercules presenting their ships photo for the Mission Gallery. Receiving the Photo is Jenny (Top) and Maria (Bottom Right). 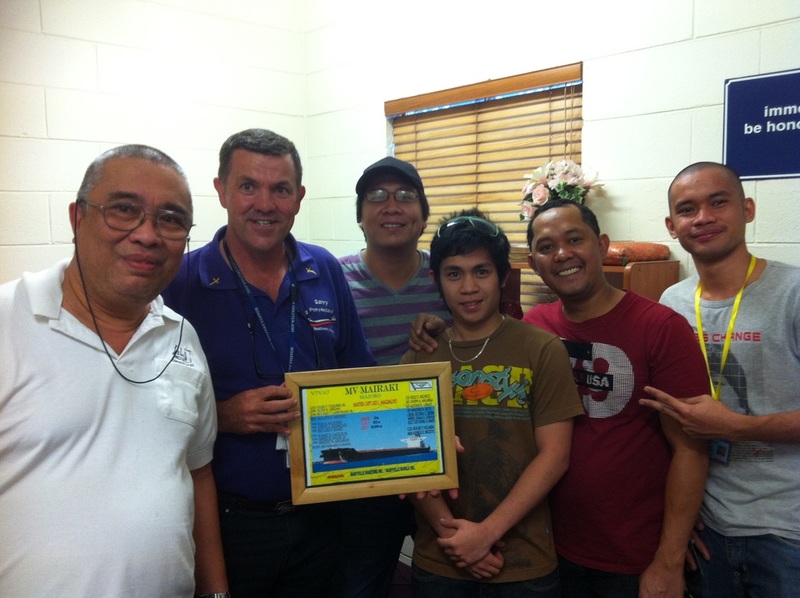 Chaplain Garry precenting Philippino crew with Gideon Bibles. 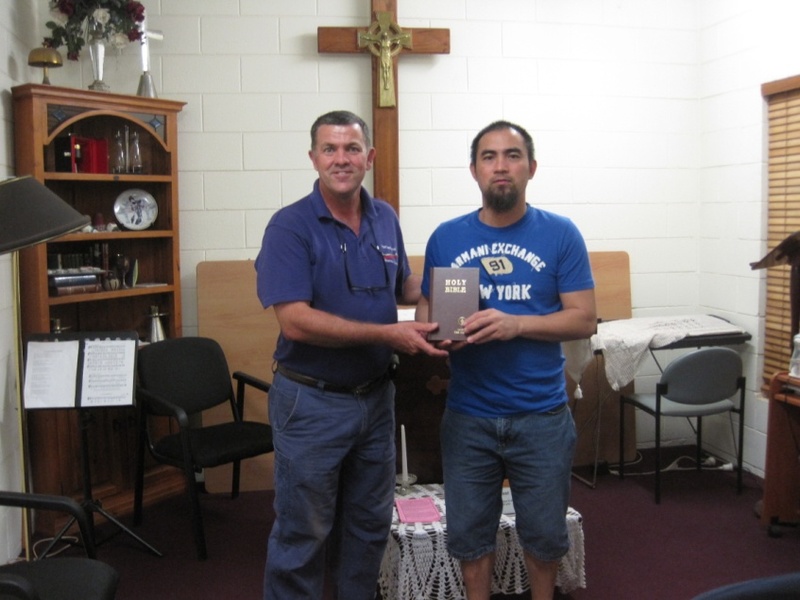 The Bibles were donated to the Seafarers Mission by the Gideon’s to give out to Seafarers. Christmas 2012 will certainly be a Christmas that will not be forgotten anytime soon. The frenetic nature of all the events that made up the seasons celebrations is now past but as I reflect after drawing breath and taking a post event look at what went into this year’s celebrations. To make a brief but not diminishing summary of events hopefully will serve you the reader to journey a little with us. As a Christian organisation that reaches out beyond all the faith boundaries we enjoyed linking in with well over 1000 men and women who make up our visiting seafarer community. These people can and often do spend well over 9-12 months before seeing family and loved ones, especially at a time when we Aussies traditionally celebrate families. In around October we had a band of BHPB and local volunteers help us in stuffing and packing 1000 gift bags in readiness for the event. 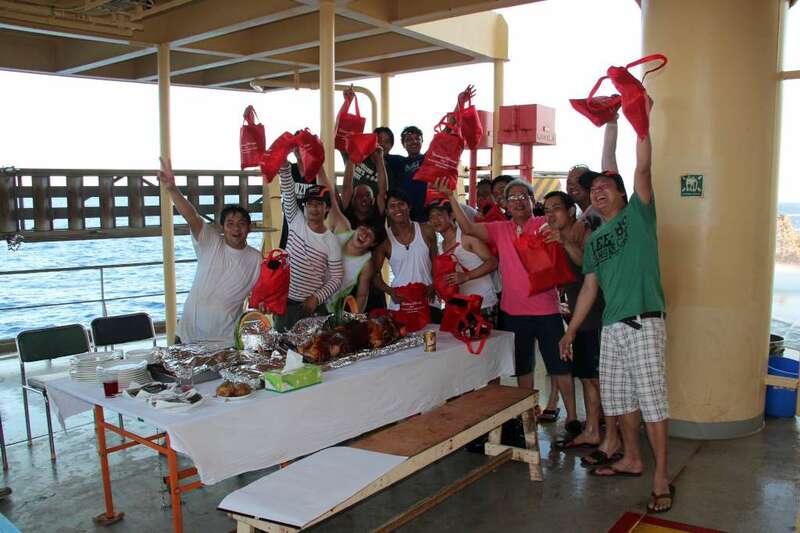 We had in excess of 30 volunteers and staff involved in many activities that allowed us to distribute the 1000 gift bags to seafarers that sailed in and out of our port during the week that led up to Christmas and then the week that followed. Thanks to Jayrow Helicopters they enabled us to air lift 37 hampers to seafarers who were at anchor during the Christmas period. 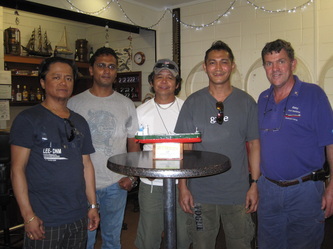 We celebrated and fed well over 150 seafarers, tuggies, volunteers and staff. Seafarers and Seawest launch provided a continual service on the harbour enabling all seafarers the opportunity to come ashore. Hedland Launch service geared up to help us distribute around 450 gift bags on Christmas morning. Some might be asking at this moment how did this Not for Profit Christian mission get the money for all that? Well heartfelt thanks go out to, BHPB, FMGL, Woolworths, RSL, Tuggies both rank and file and skippers, Optus, Gotalk, Coles & K-Mart, suppliers to the seafarers mission. All these companies chipped in large and no so large but collectively we pooled all the support and made Christmas 2012 a time to remember for all the seafarers and non-seafarers alike. Our youngest volunteer, Archie Rocavert, helping stuff Christmas gift bags. MV Polymnia - Journey 5.0 "Seaman's Life"
A video produced by a crew member of the MV Polymnia, Journey 5.0 "Seaman's Life", gives a glimpse into the lives of Seafares on working on-board bulk carriers throughout the world. The 7 part documentary was originally produced for the friends and family of the Seafarers serving aboard the MV Polymnia. 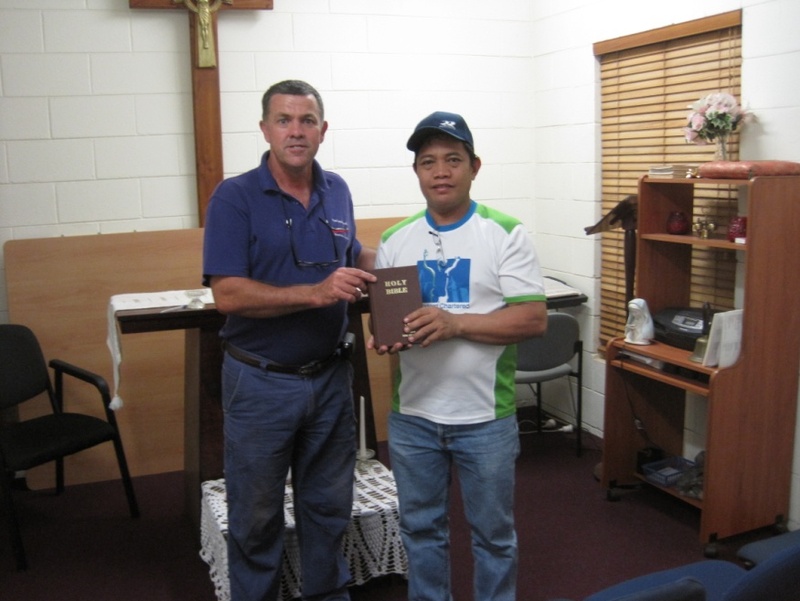 Myanmar crew aboad the MV Cape Advance reading a Gideons Bible supplied by the Port Hedland Peace Memorial Seafarers Centre. 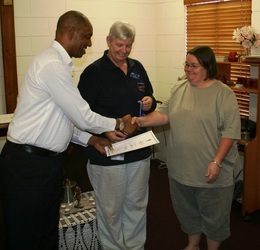 The Chief Officer of the MV Ocean Lady receiving a Jesus DVD from Assoc. Chaplain Gary. 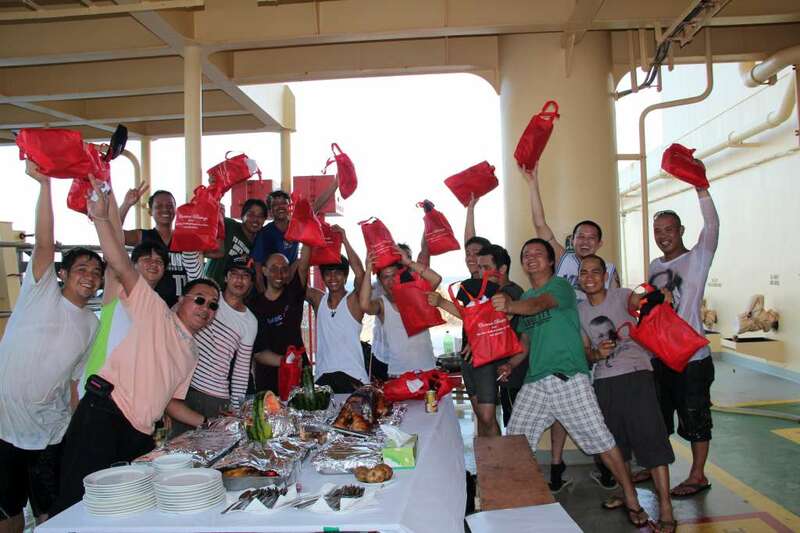 Every now and then we get thanked for our work with the seafarers. This is one of those times. A group of the mission's staff were treated to a tour of the ship and to dine with the master, officers and crew, with much delight to the taste buds. A big thank you to the Daniel N for their hospitality. The crew of C. Frontier precented Assoc. Chaplain Gary with a model and plack of their Ship for display in the Port Hedland Seafarers Centre. 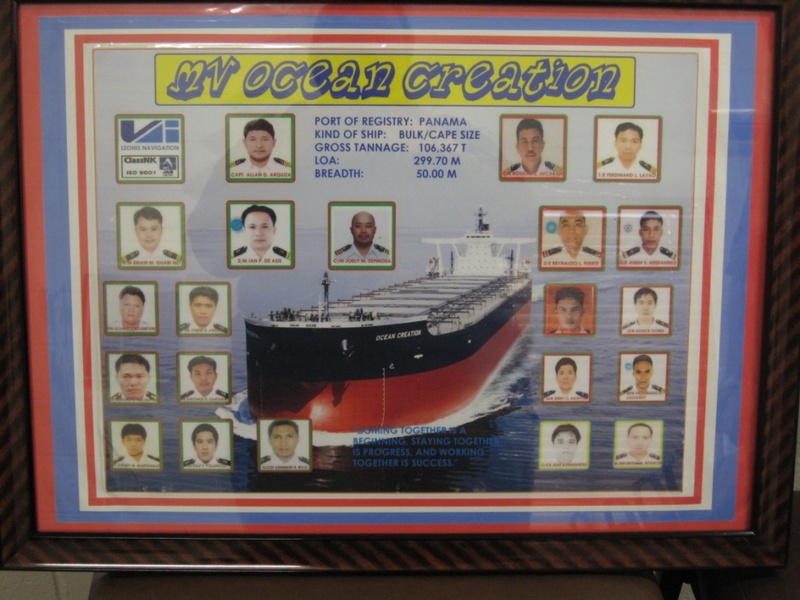 April 2013, the Captain and crew of the MV Mairaki presented a framed photo of their Ship and crew to the Seafarers Mission for the ‘Hall of Fame’. The crew of the Ocean Creation presented chaplain Garry and his wife Kathy with a framed photo of their ship and crew for the Seafarers Centre. 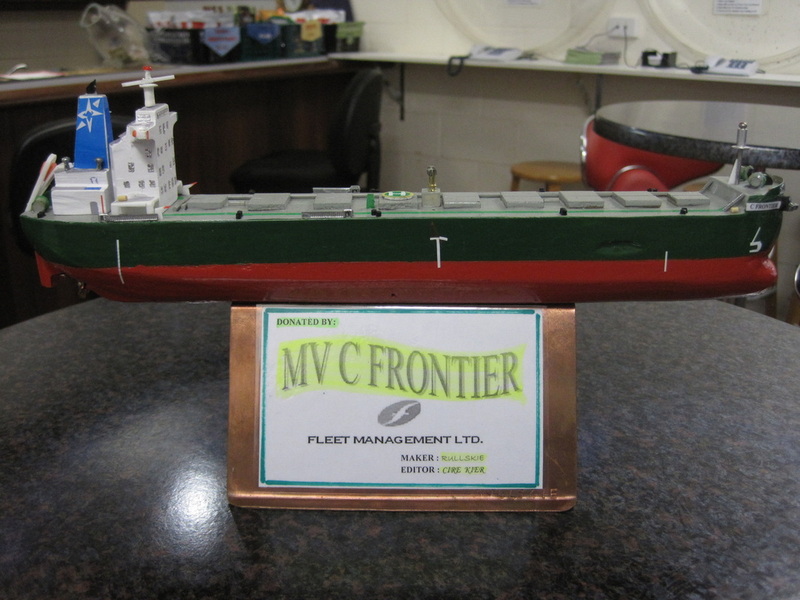 This photo is displayed in the Seafarers Centre ‘Hall of Fame’. The blessing of the MV Tonda Sea by Chaplain Alan Mower on the 21/11/2012. Please be sure to update your records. We would hate to miss out on any of your mail! Our other contact details can be found on the Contact Us page. 01-04-13 - The Port Hedland Seafarers Centre is now capable of moving more seafarers than ever, with the recent arrival of its new bus. The Chinese built BLK bus can seat 43 seafarers comfortably for transfers to and from the Public Jetty, Mission, Shopping Centre, Airport, or wherever they might want to go! 02-01-13 - The Port Hedland Seafarers Centre is now a registered agent for Western Union's money transfer services. You can now send money to anyone around the world with ease. Coupled with our Currency Exchange Service, you can complete your money transfers with minimal fuss, all in one place. Come in and see us for more information. Track the location of ships in the port and anchorage live! 19-12-12 - You can now track all the ships docked in Port Hedland and waiting in anchorage in realtime! Thanks to the Port Hedland Seafarers Centre, you can now view the details of visiting ships from any internet enabled browser! Using the Automatic Identification System (AIS), which was initially intended to help ships avoid collisions, can display Speed, Direction, Destination and more on an easy to use map. To use this great service, just click on the Live Ship Map (AIS) for Port Hedland link on our homepage. 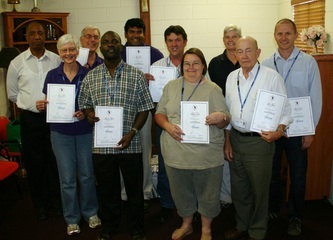 1-11-2012 - The Port Hedland Seafarers Centre has extended it's opening hours! Along with the entended opening times, there are additional launch services attending to the ships at berth in the Port Hedland port. Our new times are 9am to 9pm, 7 days a week. For launch times, please contact the friendly staff at the center or download the Daily Launch Service document on the Services page.